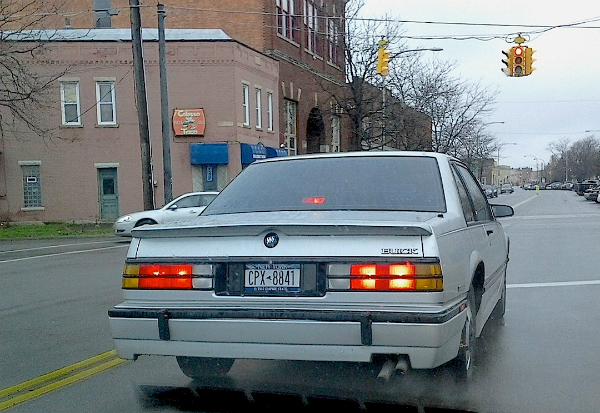 I was wishing I could have followed this 1987-89 Buick LeSabre T-Type coupe and gotten a better photo, but sometimes you just have to be someplace else — in five minutes! One of GM’s last full-sized two-door sedan/coupes, the LeSabre shared a body with the Olds Delta 88 (one of which we also photographed just two days later). The T-Type option package was pretty much sold across the Buick line, from the little Skyhawk right on up to the giant-sized Electra. Saw this one in downtown Tonawanda one recent rainy afternoon. Jim Corbran, RRofWNY …and check out our Facebook page: Non-American Classic Cars The post RealRides of WNY appeared first on Buffalo Cars.